(Dan Trimmer, 1998). Tetraploid (CUSTARD CANDY x TET SILOAM TOM HOWARD) 22" EM Dor Fra. This fertile, compact extremely well branched small flower has 4 or 5 lateral branches, and 35 to 40 buds per scape. 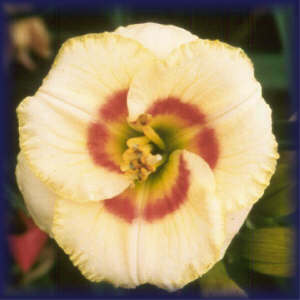 The 3 1/*" flowers are cream pink with plum eyes, and dark green throats. The carousel configurated blooms feature blunt rounded sepals and round petals, giving the overall effect of circular perfection in a small tetraploid. Foliage is broad and arched and the plants grow and increase well making rather large plants. BABY MOON CAFE exhibits plant superb habits similar to both of its parents, but I believe BABY MOON CAFE WILL perform better than either of its parents in the deep south based on its first year in Central Florida.